PORT JERVIS—A heroin epidemic is happening all around the country and Port Jervis has not escaped it. Sgt. 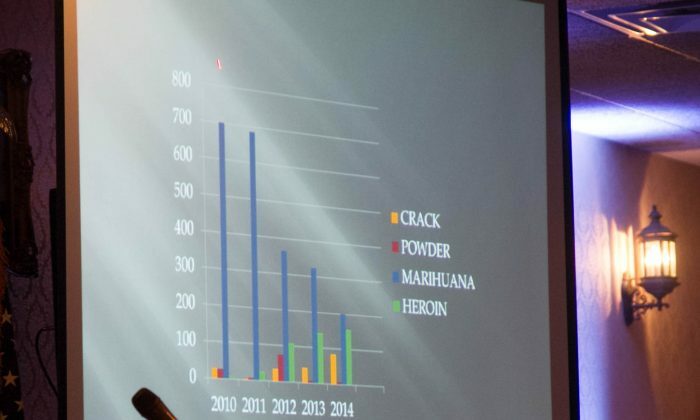 Michael Worden of the Port Jervis Police Department said at a meeting on street drugs on Aug. 31 that a dramatic increase in the use of heroin became visible around 2012. Marijuana is still the most commonly seized drug and crack cocaine is on the rise as well, according to police data, but heroin is far outpacing the rise of any other street drug out there. Officials agree the popularity of heroin in the community is mainly due to two factors. One is the rise in the prescription of synthetic opioids, like oxycodone, hydrocodone and methadone, which act as a gateway drug to heroin. Down in the city area, the New Jersey and New York metropolitan area, they can buy a bag of heroin, a single dose, for about $3–$5 a bag. When people addicted to these medications can’t afford to buy them anymore, they turn to the cheaper, and illegal, opioid—heroin. Part of that has to do with stricter New York laws that make it harder to doctor-shop for prescription medications, as well as new formulas that make the prescription pills harder to crush and therefore inject. All of this has driven up the price of prescription opioids sold on the street. The other factor is Port Jervis’s proximity to New York City, where drugs are far cheaper and easier to get than the rest of the state. “Down in the city area, the New Jersey and New York metropolitan area, they can buy a bag of heroin, a single dose, for about $3–$5 a bag,” Worden said, adding that even with a 300–400 percent markup in Orange County, heroin is still cheaper than most prescription drugs sold on the street. A bag in this case is about the size of a postage stamp when it is folded. Almost all are little wax paper baggies that have the drug dealer’s mark on them and carry less than a fraction of a gram of heroin, Worden said. The powder is a tannish color—sometimes more white and sometimes more brown depending on what it is mixed with. Adding in other ingredients, or cutting, can exponentially increase the profit margin for the dealer, as well as the risk to the consumer. District Attorney David Hoovler recounted the story of someone who bought a kilo of heroin in New York City last week and brought it to Orange County. Users often don’t know the potency of what they are consuming until they have consumed it. The other danger for both addicts and others are the needles. The powder can be smoked, snorted, or combined with liquid and injected. Worden showed pictures of bundles of needles like those used for insulin, that heroin addicts had used to inject. Because there is always a little bit of blood left on them after they are done, blood-borne diseases can be passed among users who share needles. They also present a risk for law enforcement because when they search someone, one little skin prick is enough to get them infected. The other trend Worden is seeing is in overdoses. Heroin has gotten more potent, and the stuff that is cut, is cut a lot better, he said. This means it is stronger, and because there is no standard for heroin like there are for prescription medications, users often don’t know the potency of what they are consuming until they have consumed it. He estimated the Port Jervis police have had to use Narcan, a drug that reverses the effects of opioid overdoses, on about seven or eight people so far this year. Even more dangerous than pure heroin is when the user combines it with alcohol or Xanax, a medication used to treat anxiety and panic disorders. Besides the effect on a heroin addict’s health and social life, heroin use affects the community when addicts turn to crime to support their habit. Hoovler said 70 percent of the crimes committed in the county are related to drugs. “Somebody is either high or drunk when they commit it [a crime], or they’re committing the crime to get money because they need to get high or they need to get alcohol. Worden said some heroin abusers have a 10–20 bag-a-day habit, which, depending on how much they pay for their heroin, could be $60–$400 a day. Seventy percent of the crimes committed in the county are related to drugs. In terms of catching drug users and dealers, Port Jervis police have to work closely with New Jersey and Pennsylvania law enforcement to catch drug dealers that cross borders. Stemming the flow of drugs into Port Jervis can be difficult for another reason. In a small city where drug dealers have tight-knit networks, getting to them is hard. “We’ve had them [undercover cops] go with informants who are in the lifestyle of drug abuse, bring them to a location to buy drugs, and the first words out of the dealer is, ‘You know better than to bring somebody I don’t know,'” Worden said. While Worden is on the law enforcement side of efforts to stop the city’s drug problem, he recognizes it’s not the solution. After Worden spoke, a panel of experts from parents of addicts to hospital representatives to school leaders and addiction counselors talked about some of the efforts in the community to combat the problem: a support group for parents, a coalition that works on different initiatives to combat drugs in the city, education programs in schools, and recovery programs around Orange County. Their main message was that there are resources in the community if a person or someone they know is fighting addiction and needs help. “I think we’ve already made a difference little by little,” Worden said about the different community initiatives.